Even though Halloween is on a Monday, it’s actually on Friday and Saturday (or Wednesday through Monday if you’d prefer). There are things to do all weekend! There’s still time to buy decorations! Try Daiso, that costume store on Shattuck by the BART station, Paper Heaven on Bancroft, or even Walgreens and CVS. You can also pick up a pumpkin (Berkeley Bowl has an awesome selection of pumpkins and delightfully weird looking squash). Get some ingredients for pumpkin pie and apple cider while you’re at it. Needless day say, our favorite part of Halloween, besides costumes, is food. We know that Professor Alex Filippenko’s Halloween lecture is as engaging as a black hole — and he wears a costume! It’s worth it just for that, in our opinion, as we are of the firm belief that more professors should wear Halloween costumes in lecture. The lecture isn’t on the actual day of Halloween but rather the Friday before (that means today!) at 3 p.m. in Wheeler Auditorium. We can’t necessarily condone you crashing the class, but you may see us there if you do. The Clog is here to let you in on a well kept secret: College students party (parents who are reading this, we’re 110 percent not serious). Crazy, we know! Holidays are always a great excuse for people to go all out, so whether you are a fan of the frat, co-op, house or apartment party — there is something for you. We don’t doubt you know all of this already, but for those that want a refresher, that’s what we’re here for. If you don’t have an invite, ask around, troll Facebook or just wander around and listen for the sounds of debauchery. If you’re a dude going to a frat party, you better have a bro-friend, or gather a force of girls to go with you. If you’re a girl — well just use what nature gave you. For co-op parties, remember to bring up to $5 and wear a costume for a discount. Don’t expect beverages (they assure you it’s BYOB) unless you know someone or arrive very early (who does that anyway?). In terms of house parties, you’ll know if you’re invited, and remember, people don’t like it when strangers show up to their house. If you are of age, there’s always bar hopping — who doesn’t love going to public places in a costume? But if partying is not your scene, or you want to do more — do not fear! Later on Friday evening, the UC Choral Ensembles, including the UC Men’s Octet, the California Golden Overtones and Decadence, will be performing their spookiest to get you into the Halloween spirit in 155 Dwinelle Hall from 8-10 p.m. Admission is $5 for students, $8 regular. If you want a little more Halloween performance to entertain you, the Un-Scripted Theater Conpany is putting on “Fear,” and improvised horror show, at the San Francisco Playhouse. The show runs at 8 p.m. until Oct. 31, and no two shows are the same. Tickets are $25 general admission, $12 students and seniors, and you can get 25 percent off by entering the code HAUNTED online or at the door. Go see the Rocky Horror Picture show at the Albany Twin on Solano ($8 with a student ID). If there’s anywhere to really let your inner Halloween monster out, Rocky is the place. It’s not often playing so close, so now’s the time to jump at the opportunity, for both Rocky virgins and veterans. We are also fans of the Horror Movie Night, and will be indulging in a few zombie flicks ourselves. For simple and free Halloween entertainment, you can organize a marathon with your floor or your friends. Bring some pillows to hug, and perhaps alternate between campy and truly horrifying films. 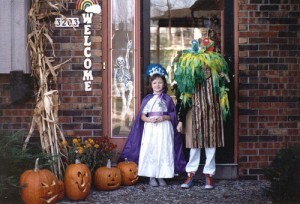 Don’t deny it: Trick-or-treating is the best. (Seriously, free candy! Who says you’re too old to go?) Solano Avenue is a popular destination for trick-or-treating, and we say, why not? You can take the 18 straight there and relive the better days of your childhood. We don’t doubt you’ll be having a fantastic Halloween weekend, wherever you spend your time. Just remember, there’s such a thing as too much Butterbeer. Should You play with what my feelings tells me or what my brain says?